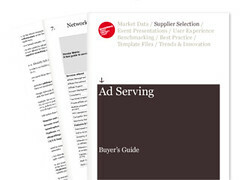 The 158-page report has a global focus, including profiles of 15 leading suppliers and taking a look at the recent trends that have reshaped the ad serving sector in the last few months. The following five trends summarise some of the main points in the report. The role of the ad server is changing, forcing providers to reconsider their approach. For over a decade, ad servers were considered to be the backbone of the display advertising ecosystem. While the market has been gradually moving towards a more strategic manipulation of data, the vast majority of ad serving vendors continued to focus on the technical aspects of ad delivery and invest in functional improvements. As shown in our Demand-Side Platforms Buyer’s Guide, platforms with real-time bidding (RTB) capabilities have revolutionised the way digital media is purchased and managed. Ad serving providers increasingly feel more pressure as prices continue to fall and emerging players enter the market. While these new platforms promote choice among advertisers, they are also forcing ad serving vendors to re-examine their proposition and technology. The significant growth of social media advertising puts Facebook and Twitter on a collision course with Google, Yahoo and other major players. In the third quarter of 2010, Facebook ranked as the top display ad publisher in the US, accounting for nearly one in four ads. Although Twitter’s ads are still considered ‘a work in progress’, the company is also in a great position to ramp up its ad revenue and challenge more established players. While Google still dominates the display advertising market, Facebook and Twitter are on the rise as social media advertising is increasingly seen as a viable alternative. Despite the hype surrounding in-game advertising, it is not expected to represent a major revenue driver. In-game advertising was expected to be a booming market, but major players have started to shift resources from it. In October 2010, one year after Microsoft was trumpeting the success of in-game advertising, the company announced that it was shutting down Massive (purchased for over $200m in 2006) and planning to repurpose the technology. Electronic Arts has also reported that micro-transactions on virtual goods have proved to be a much more reliable source of revenue than in-game advertising. Econsultancy’s Social Gaming Smart Pack has revealed that the main revenue driver in the social gaming sector is represented by sales of virtual goods and currency, rather than in-game advertising and branded content. Therefore, while the in-game ad market will continue to exist and offer value to some categories of advertisers, it will probably not be a major revenue driver in the long-term. First-party ad serving providers are expected to drive growth in the ad serving sector. Over the last few months, data has become a focal point of the display advertising ecosystem. While most data integrations are currently limited to RTB-enabled platforms, data is expected to become an essential component of ad serving offerings. By enabling advertisers to deliver, manage and measure their digital advertising campaigns from their own domains, facilitating integration with CRM systems and web analytics, first-party ad serving providers are already enjoying benefits from this trend and are expected to drive growth in this sector. New ad formats and advanced targeting techniques aim to increase engagement, relevance and acceptance. Display advertising has undergone a major transformation over the last few months – not only in terms of how ad units are bought, served and managed, but also the extent of rich-media functionality they provide. Traditional banner ads are gradually being replaced by more visually appealing, engaging and informative ad units such as AOL’s Project Devil and IDG’s Nanosite Ad Unit. The IAB has also taken steps in this direction with the aim to update its standard advertising units for the first time in 10 years. On the targeting front, audience targeting has gone mainstream in the last 12 months and multiple media placement strategies are increasingly being used to increase campaign performance. As advertising-as-content and audience-based buying have just started to gain traction, it is still not clear if these ad units and advanced targeting capabilities can unleash the next wave of innovation in the display advertising market.